PIXAR is, by far, one of my favorite animation studios working today. It used to be my all time favorite, but I feel like its previous title as, “Utterly Infallible” has been revoked by the presence of ‘Brave’ and the ‘Cars’ franchise. Still, excluding those, I find just about every PIXAR film solid gold. And the goldiest of the gold? The film so good, that it was the first I’d ever bothered to see in theaters, twice? Everyone knows this one; 800 years after humanity royally screws up, ditching an essentially barren Earth, a little robot is among the last beings left on the globe. The droid in question, Wall-E, is the last surviving member of a series of cleaning droids who’d been left to repair the planet for the humans to migrate back. All he has is himself, a pet roach, and various knick-knacks he’s scrounged up, having developed a sense of curiosity about the world he’s been left in. His incredibly lonely status quo is suddenly shaken up, by a spaceship arriving seemingly from nowhere, that drops off a sleek, feminine robot named EVE. Wall-E is helplessly smitten, but EVE doesn’t seem to do much more than blow stuff up. Her true purpose becomes clear when Wall-E shows her his latest discovery: the first plant to grow out of the Earth in centuries. Taking the plant, EVE shuts herself down before her ship returns to take her away. Wall-E, tagging along, is dropped onto The Axiom, where, the human race has grown contented and flabby. Almost every inch of the Axiom is automated, and it’s Captain is completely clueless as to what to do with the plant, as a sign to return to Earth. EVE is separated from Wall-E, ‘causing the latter to desperately try to reconnect. That attempt, causes all sorts of shenanigans, and unwittingly gets humankind back on its feet. I find the story to be one of the most underrated things about this movie. PIXAR has always (well, almost always) had tight, focused screenplays, and this film is no exception. Not a second of screen-time is wasted, with every scene / plot point having a clear purpose to both the story and its characters. The pace is consistent to a tee, so nothing ever feels like it’s dragging. This makes it incredibly easy to rewatch, without ever feeling bored. I’m aware that there’s a vocal camp out there, who feel that the first forty minutes, where there is minimal dialogue, is the greatest part of this film. While I don’t disagree, I don’t think the latter half of the movie was a slouch by any means. Admittedly, when I was younger, I was unreasonably excited for this movie. The premise of a largely dialogue-free movie, focusing on only two characters, was so unique, that I ended up doing a double take when later ads freely displayed The Axiom scenes. I say this because, despite having this mentality from the start, I do think moving on to The Axiom was the best possible road for the film to take. I can easily imagine the movie wearing itself a bit thin, had it stayed on Earth for the entirety of its running time. Then there’s that pesky environmental theme. Most of the flak this movie gets, is for beating people over the head with its anti-consumerist message. Firstly, I don’t see the message as a problem at all, as it is firmly the B-Plot of the movie. The romance between Wall-E and EVE takes the front seat. Secondly, the message doesn’t exist so much for the sake of itself, (like most of its ilk), but as a way to develop the human cast and keep their story interesting. Thus, the movie can end happily for the humans, without their growth seeming like an unwanted distraction from the robot characters. Thirdly if the people behind the movie are to be believed, the movie was never intended to be anti-consumer. The plant, along with mega-corporation Buy-N-Large were merely conceived as macguffins to get the plot moving. I struggle to find a story element in this film that doesn’t work. Even then, I still fail to come up with anything. If that’s not the sign of a great story, I don’t know what is. The cast, though a bit simpler, is just as well put together as the plot. 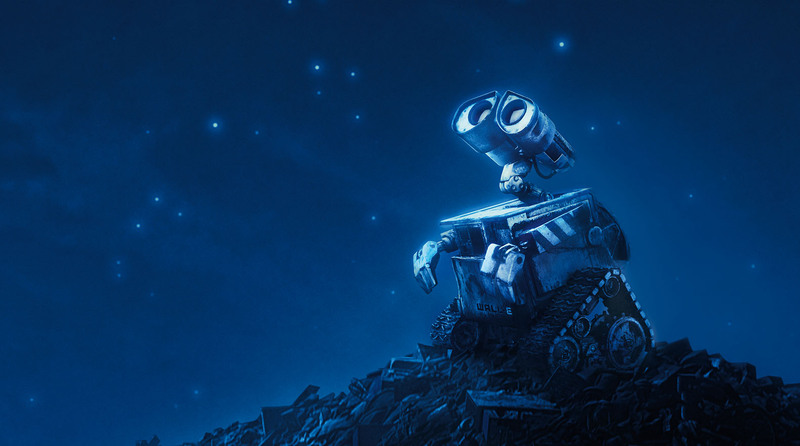 Wall-E is the clumsily curious ingénue, who directly jumpstarts a change for the better in anyone he has contact with. He’s an incredibly lovable and entertaining screen presence, and it’s through him, that the audience becomes emotionally invested in the story. EVE is equally investing, going from cold, distant, and, well, robotic, to incredibly emotional. By the end, the audience feels so much for her that she might as well be flesh and blood. The eternally awesome Jeff Garlin, provides the voice of Axiom Captain McCrea. The Captain serves as a sort of deuteragonist, and is kept in the audiences good graces due to his helplessness, never coming off as obnoxious. Then there’s AUTO. AUTO is a truly effective villain, mainly because he’s so diametrically opposite to Wall-E. They both share a sense of stubbornness, but Wall-E’s is motivated by love and curiosity, while AUTO is adamant in the pursuit of safety above all else. The fact that AUTO (unlike his kin of, GLaDOS or HAL 9000), doesn’t even have a human voice actor, creates a huge disconnect from the audience, making his presence truly terrifying. The film sports a notable supporting cast of humans and robots, my favorite being the obsessive-compulsive M-O. This movie was animated by GODS! 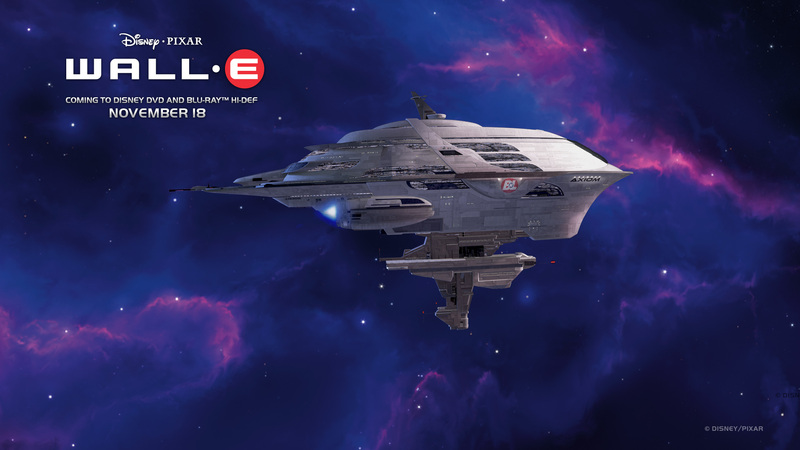 This six-year old movie hasn’t aged a day and is, in my opinion, the best looking PIXAR has ever been. Now that’s saying a lot, as I generally find five years to be the point at which animated movies look at least somewhat dated. From the dingy, broken Earth, to the sleek and vibrant Axiom, everything looks detailed to the point of photorealism, and the characters’ simple charm doesn’t clash with that at all. Also, that space! On top of that, the music makes me feel wonderful things. Special mention goes to “Define Dancing” and “The Axiom,” for getting me in that majestical mood. Nothing I say about this movie can actually do it justice. There’s not a single aspect to it that doesn’t work on some level; the humor, the emotion, the animation and so on. It remains my personal favorite PIXAR and one of my all-time favorite films. I heartily suggest that anyone who hasn’t already seen this movie stops taking Crazy Pills, and that anyone who has seen, it see it AGAIN. Posted on May 14, 2014, in Movie Reviews, Other Movies and tagged Animation, Disney, PIXAR, Romance, Sci-Fi. Bookmark the permalink. Leave a comment.